Bengaluru-based self-publishing start-up, Pratilipi, is providing a platform for fiction, poetry and more in Hindi, Gujarati, Tamil, Telugu, Marathi, Malayalam, Kannada and Bengali. Founded in 2015, Pratilipi (a Sanskrit word which means ‘you become what you read’) initially began as a website. Why? Because the internet only accounts for about 1% of content in mother-tongue languages from India, and the idea of Pratilipi is to promote regional language content instead of English. Many Indians who are well versed in their own regional dialect with very little knowledge of English, face this discrimination every day. Where there is a lack of content for them to consume. Therefore, to give this audience something to read, Pratilipi gives writers acquaint in their regional language the opportunity to create content and publish it. “We are a self-publishing platform where people can come and share their stories, without the barrier of languages,” co-founder Ranjeet Pratap Singh said. 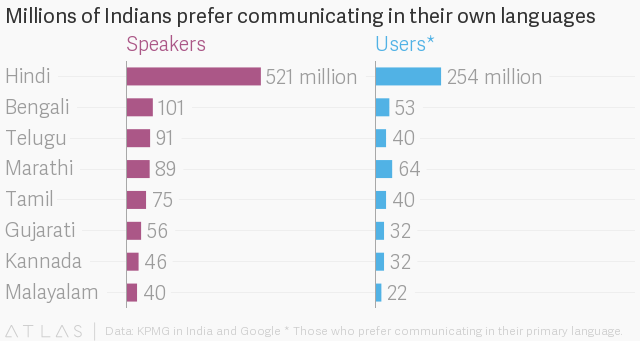 On its launch, the website featured only two languages: Hindi and Gujarati. This soon expanded to include six more languages: Bengali, Marathi, Kannada, Tamil, Telugu and Malayalam. After starting out with the website they then developed a Pratilipi app. ATLAS reports that Hindi remains the most popular language in India among writers and readers, accounting for 254 million users. Yet there are seven other languages widely-spoken throughout the country, making up 80% of India’s population. In India, the publishing landscape is predominantly dominated by educational books. Yet it is also one of the fastest-growing in the world. In a 2015 report by Nielsen, English books accounted for 55% of sales while Hindi and other languages accounted for 35% and 10% respectively. Just as there is a resurgence of demand in diversity for English literature, there is an increasing demand for regional content in these underrepresented languages. This is where Pratilipi comes in. Revolutionary in its goals, the platform introduces India’s potential for literature and poetry and showcases the hidden gems of the country’s many languages. In an overwhelmingly English-dominated publishing industry, Pratilipi caters for those who have always wished to read stories in their mother-tongue. Singh spoke to Quartz India where he emphasizes the importance of diversity in writing and the demand for a platform to showcase India’s multilingual literature. In 2014, Ranjeet Pratap Singh along with Prashant Gupta, Sahradayi Modi, Rahul Ranjan, and Sankaranarayanan Devarajan aimed to produce a platform to share stories written in Hindi and Gujarati. The creators raised 30 lakhs (approximately £30,000) in funding from TLabs (Times Internet Accelerator). In 2016, another $1 million (£720,860.00) was raised with Nexus Venture Partners. The Pratilipi app boasts more than one million downloads and has achieved a 4.8 star rating on the Google Play Store. The platform was awarded by IIT Bombay Eureka Award, and the StartUp Launchpad Award for Best StartUp. With the motto, ‘Let’s make India well-read again’, Pratilipi’s young founders placed on Forbes India’s 30 Under 30 2018 list. Pratilipi gives access to over 160, 000 published pieces, with well over 1.5 million readers. Fiction dominates with approximately 70% of the content, while 60% of writer are men and 71% of readers are women. Future plans include involving more users such as launching audio content or updates for literature on the move. Yet Pratilipi’s goal is not only to get Indians to read more, but also to write. “About a year back or so is when the magic started happening. People who are not writers, who have never written anything before…they started writing.” Singh comments. “We believe that everybody has a story within themselves,” says Singh. With Pratilipi’s continued growth and the publishing industry’s drive towards diversity in literature, this platform is certainly one to watch for mother-tongue literature. Is the South Asian Mother Tongue being Lost in the West?